The Quinnipiac Bobcats have returned from the desert after a tie on Friday and win on Saturday against the Arizona State Sun Devils. From here on out its league play as Quinnipiac positions itself for the ECAC tournament as they need the best possible match-ups for the conference tournament considering they don't have any chance of getting into the NCAA tournament without winning the ECAC tournament. Quinnipiac next plays against Princeton at home on January 30th. Now lets take a look at how some of the future Bobcats did over the past week. 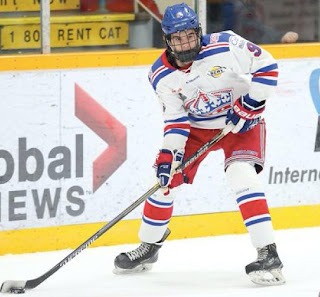 Ethan De Jong had 2 goals and 1 assist in 3 games played this past week for the Prince George Spruce Kings. The teams leading scorer now has 45 points (15 goals, 30 assists) in 39 games played. He is #154 on the NHL central scouting list for North American skaters. Desi Burgart of the Surrey Eagles had two assists in three games played this week for the Surrey Eagles. In 41 games played this season, Burgart has 38 points (17 goals, 21 assists). T.J. Friedmann had a good week with 2 goals and 1 assists for the Victoria Grizzlies. He has had points in four of the last five games for the Grizzlies. On the season in 46 games played he has 38 points (15 goals, 23 assists). 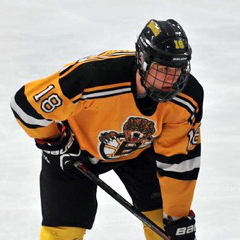 Dom Fensore picked up two assists for the U-17 team in USHL action over the weekend. In 17 USHL games played, Fensore has 7 assists. In all game action this season he has a total of 17 assists in 32 games played. Peter Diliberatore was named ranked as the #111 best North American prospect according to NHL Central Scouting for the mid-term rankings. John Campomenosi had a goal and three assists for Don Bosco Prep in 3 games played this week. On the season he has 17 points (5 goals, 12 assists). Gus Van Nes had a good weekend for the Junior Bruins with a goal and 3 assists in two games played against the Jersey Hitmen. Van Nes 49 points (14 goals, 35 assists) in 36 games played this season. Daniel Winslow had one assist in two games played for the New Jersey Hitmen as his team lost a pair of games this past weekend. In 31 games played he has 26 points (9 goals, 17 assists). Connor Tait had a goal in two games played this past weekend for the New Jersey Hitmen. He has two goals in his last three games played. On the season in 29 games played he has 10 points (6 goals, 4 assists). Jacob Quillian had 3 assists in Steele Subaru's 6-0 win yesterday. In 31 games played this season, Quillian has 40 points (13 goals, 27 assists) and leads the team in scoring. Jack Silich had a goal and an assist on Saturday for the Chicago Mission. They had two other games over the weekend but the box scores have not come in for those games. Victor Czerneckianair has a strong season for the U-15 Selects team at South Kent. In 40 games played this season he had 57 points (23 goals, 34 assists). The Southington, CT native is 3rd on the team in scoring and a possible candidate for the NDTP program. Ethan Phillips has jumped up to second in scoring on the U-16 Selects team at South Kent. In 39 games played he has 59 points (28 goals, 31 assists). P.J. Fletcher has continued to improve this season despite missing some time with an injury earlier in the season. In 31 games he has 42 points (19 goals, 23 assists).